UEFA Champions League Final: How will the teams tactically set-out? 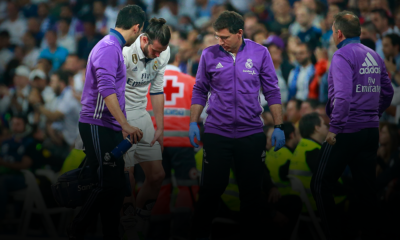 We have now finally come to the final stage of the Champions League, with a team that has not been good enough in the past few editions of the Champions League in Juventus, and Barcelona, who also started off this season with problems as well on and off the pitch, with an apparent rift between Messi and Enrique, but after the defeat against Moyes’ Real Sociedad, has transformed into an unstoppable team, not losing a single game. If we could separate these teams in any way, than that would without doubt be on the basis of style of play. The percentage of the ball-possession that Barcelona has in a game on average (this season) is 62 % while on the other hand you have Juventus with 52 %. Though Barcelona has the philosophy “Juego de Pocesion”, Barca and Juve have some characteristics that are quite similar to one another. In recent years we have seen a very predictable Barca with the short-passing style of play from side to side with no real threat other than that of Messi’s individual brilliance, which many teams were able to defend against, because of the predictable way of playing without many variations. With Enrique though, Barcelona now has many different ways of attacking which makes them harder to read and more difficult to defend against. Juventus also threaten a lot with their direct-style of play with two fast forwards, where the focus is to penetrate and attack through the vertical/central zones of the pitch, with Tevez often being the one rushing with the ball in great speed and control. They can also take advantage of the flanks with the full-backs: Evra and Lichtsteiner if needed. Playing a 4-4-2 with a diamond where basically all 4 midfielders are central-midfielders, Juventus seeks to break the opposition defenders attacking through the central areas. 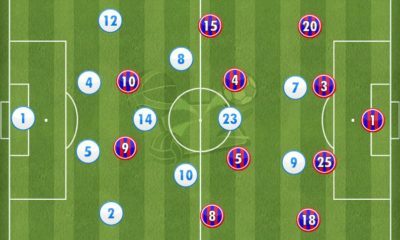 Barcelona has Messi penetrating the wide-area as the ‘’starting’’ position but is often seen dropping deeper to seek the ball, so that he can advance and threaten the half-space (tight areas). What Enrique has done is to have a rotational system of positions where if Messi is penetrating the central area for example a position where Rakitic should/can be positioned then Rakitic is the one to penetrate the area that Messi has left behind (wide-area). 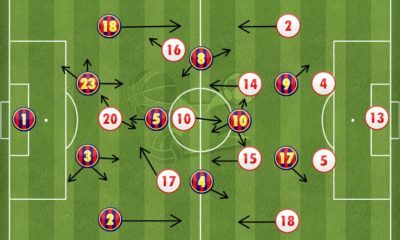 During an away game vs Sevilla (2-2) we could see that Tremoulinas played a zonal-marking system vs Messi, and whenever Messi started penetrating the central area of the pitch, Rakitic started to run to position himself in the ‘’starting-position’’ of Messi and Krychowiak followed Rakitic out wide, which means that Unai Emery was very aware of this tactical-move of Barca. This didn’t make it any easier to defend against though. This move is done to give Messi more space but also to still have the 3-man attackers upfront, to keep the balance within the team. Tevez is exactly like his fellow Argentine, dropping deep to seek the ball, often between the lines of defense of the opposition teams. Juventus wants to have Tevez rushing/dribbling with the ball in possession, towards the opposition defense at full-speed which is a great quality that he has (not as good as Messi) and is very hard to defend against. With his great speed, control and stamina Juventus have also used Tevez’ ability to run past defenders with the ball, starting his rushes to play the direct style of attack even deeper down in Juve’s own half (if say they have recovered the ball) where he more than often runs from box-to-box with the ball in possession. ( The cause of the penalty vs Real Madrid in the 1st game, was Tevez’ rush from Juve’s own half to the Real Madrid penalty box almost 70 meters). Whenever the Argentine wizard drops deep in the build-up/attack of Juve, we can see that the Italians have a pretty similar way of rotating between specific players to keep the balance of the team, where Vidal (the No. 10 of the Juve diamond) takes up the number 9 position which Tevez vacates. I personally don’t think that Barcelona will switch their philosophy for this game as they are the favorites, they are the superior team with the ‘’better’’ players, meaning that they will play their regular 4-3-3 with their different variations, which leaves the other team to adapt. Juventus will probably be focusing much more on the counters and they will let Barcelona keep the ball, and try to keep a compact team in horizontal and vertical line with a big focus on the central area of the pitch, where they can try to set ‘’pressing-traps’’. In this game I believe that a 3-5-2 system will be played by Juve, because of the very flexible defensive use that you have of this system. We know that Barca seeks to have Messi in the false-9 position. So to block this space/zone Juve can switch from a 3-5-2 to a 5-3-2, 4-1-3-2 or 4-1-4-1 depending on the situation. Having 3 centre-backs vs 3 forwards of Barca, 2 wide-players vs full-backs of Barca and a 3v3 in midfield makes it hard for Barca to find any easy way through as this system gives flexibility to use your full-backs in different ways, for example: If Messi is penetrating the half-space, then 1 of the centre-backs is able to leave his position to try and mark Messi , while a full-back then could/should join the 2 centre-backs to still keep the 3-man defensive line. 4-1-3-2 formation, where Lichtsteiner will leave his full-back position to create a 3-man defence with Evra still a bit wider. Notice the Chiellini-Messi (1v1). 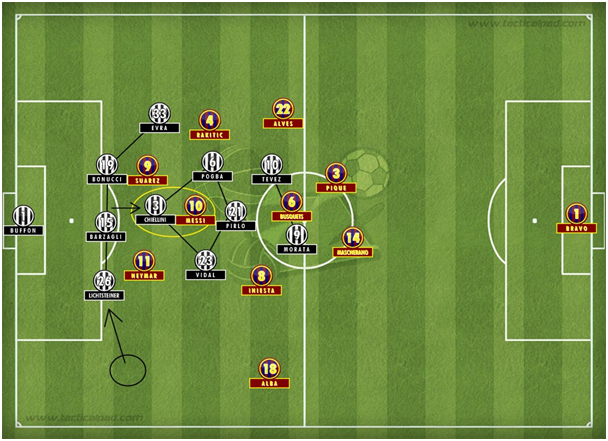 Juventus has been very compact through-out the season and stays very compact, especially in the central areas of the pitch, giving the opposition more spaces on the flanks where Juve then tries to out-number the opposition and press with an aggressive approach. What will be interesting is the way that Barca will cope with the counter-attacks of Juventus, and how Juventus will solve the rotational-system of Barcelona which seems to be extremely hard to defend against. 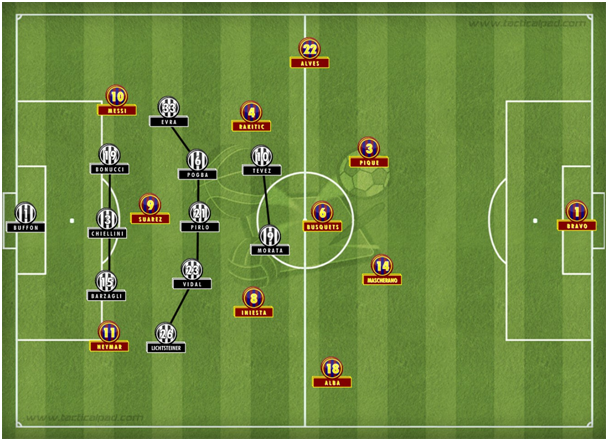 I personally believe that a high-pressing approach (counter-pressing) is the way to beat the Catalans but that is not what Juventus will try to implement as the Italians will try to block attractive spaces for Barcelona and stay compact to then threaten in a direct-style of attack. That is why, due to the different variations and flexibilities that Juventus are able to implement during different periods of a game, and also their ability to adapt and find the weak-links of their opposition, they will eventually become the champions of Europe!